Just prior to the start of the Dominguez Hills Criterium it started raining, so going fast from the gun was on the minds of some of the riders in the field. With a few laps in the race there was a break that had formed off the front, going after one of the seventeen $50.00 primes through out the days race. SoCalCycling.com Team (Ethan Batt and Callum Gordon) and Moment Bicycles (Vincent Gonzales and Jean Louis Bourdevaire) both had two riders represented along Rene Guillermo and SDBC (Kenyon Ralph) also having one rider each. As the rain came down it seemed like SoCalCycling.com Team’s Ethan Batt and Callum Gordon wanted to make it rain money the whole time when the break stayed away for around 25 – 30 minutes of the race. 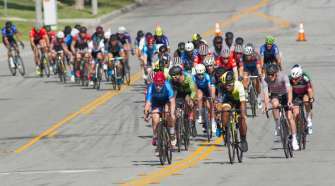 They kept the pace high and just out of reach of being caught, holding a small margin of 15 to 25 seconds for most of the 25 – 30 minutes of being off the front taking all the primes. After about 35 minutes of being off the front the pack kept the pressure on and the group all came back together only to have more counter attacks from more of the SoCalCycling.com Team. 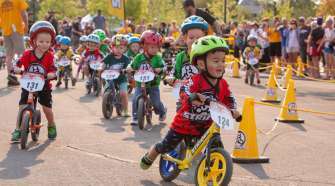 The SoCalCycling.com Team was on a mission to collect as many $50.00 primes from the race as they could possibly get and see if we could get someone on the podium. It turns out that no breaks would really gain much time and would last no longer than a lap or two. So with the race dropping several riders due to the rainy conditions and high speed. The primes kept coming and the SoCalCycling.com Team riders kept on collecting them through out the race. With the final laps nearing the SoCalCycling.com Team went to the front and started a the leadoff train with Danny Kam (Monster Media) and Cory Williams (Elevate KHS) waiting patiently with rested legs after hanging out in the pack for most of the race. Coming into the last corner and heading into the sprint it was the SoCalCycling.com Team near front but getting out jumped as the sprint was opening up it was going to be a drag race between Cory Williams (Elevate KHS) who took the win, with Danny Kam (Monster Media) holding down second and Callum Gordon (SoCalCycling.com Team) gaining ground and holding onto third place respectfully. 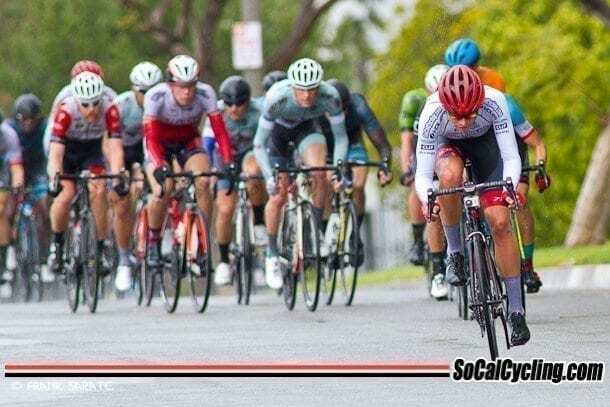 This made for an exciting race and showing that the SoCalCycling.com Team would be a force this season after Leo Bugtai had placed seconda couple weeks earlier lapping the field and Jason Cianfrocca getting a win the week before in a sprint and with several podium near misses just weeks prior. 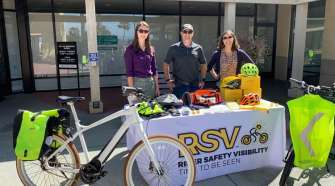 Thanks to Seth Davidson at Seth Davidson Bike Injury Lawyer for kicking down all the generous $50.00 primes and Jeff Prinz for making a business park crate, not look and feel like a typical business park crit.